Toughook is the original unbreakable plastic coat hook. Designed and manufactured here in the UK by Spectrum, Toughook is perfect for nurseries, schools, fire-stations, hospitals and gyms; where public safety is a top priority. 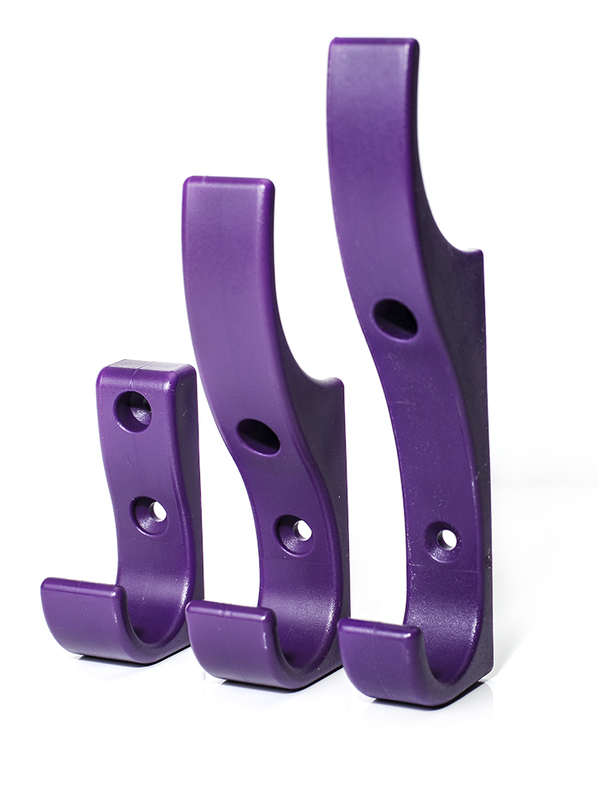 Replacing dangerous metal hooks with unbreakable plastic coat hooks couldn't be easier. Toughook is designed to use or cover existing screw holes, so they're easy to fit and leave a clean finish. Choose any of our thirteen colours, from Simple Black to Canary Yellow; find the right colour for your use. You can even mix and match colours to add some decorative flair to your cloakroom or changing room. For larger orders (over 100 pieces) we can create custom colours to match your new or existing colour scheme. In the age of compensation culture and litigation, safety needs to be a top priority. You need to constantly assess how the public will use your facilities and what dangers might exist. Typical coat hooks made from a cast metal such as aluminium are one of those dangers. Whilst common, metal coat hooks have two significant disadvantages. Their brittle construction makes them easy to break and their pointy design can cause eye and shoulder injuries. Metal coat hooks, with their stiff protruding parts present a serious risk of eye and shoulder injuries — this danger greatly increases when the hooks are damaged (deliberately or otherwise) leaving broken, jagged edges. To remove both of these dangers, we designed the Toughook. Once fitted in your school, nursery, gym or cloakroom, the Toughook design offers you peace of mind. The flat K-Curve profile protrudes only a few millimetres from the wall providing both upper and lower hooks just like traditional metal hooks. The industrial nylon construction has bevelled edges to eliminate sharpness and help to further prevent injuries. Vandalism is a worry of the past thanks to Toughooks. The nylon construction makes these coat hooks virtually unbreakable. Nylon isn't brittle like metal and is almost impossible to snap but easily matches and even beats metal for load capacity. If your Toughook gets vandalised, we'll replace it for free. Every Toughook comes with a lifetime guarantee against vandalism. Your Toughook will never break. Eliminate broken hooks and likelihood of injuries by fitting Toughooks in your school cloakroom or changing room. You don't need to wait for a complete re-fit to improve the safety of your changing room. Toughooks are designed to fit or cover existing holes; making your cloak room safe whilst avoiding unnecessary expenses. Choose the colour that suits your organisation or get a multi-coloured mixture. We offer twenty original colours and because we are the original manufacturer, we can even make custom colours to suit you. Be sure to ask about our 10% discount for educational establishments. Keep your changing rooms looking tip-top for longer thanks to the vandal-proof qualities of the unbreakable plastic Toughook. The nylon Toughook won't be bent or snapped by vandals and can be ordered in any colour to match your corporate or club colours. You can buy Toughooks online or call for education or public service pricing; Schools, NHS, Fire and Police receive 10% discount.